Customers have a “use it or lose it” mentality about your product. They want to pay for something that's giving them value—so if they're not using it, they'll stop paying for it. Integrations help get your product in front of your users so they have more reason to use it. It embeds your product more naturally in a user's workflow—and this means it becomes more necessary to their process. A good integration compounds the stickiness of your product by adding more pathways to and from the product, and more ways for your product to deliver value. When users find more value in your product and more reasons to use it, they engage more and and are less likely to churn. Integrations can be the conduit your product needs to provide a better user experience and promote engagement. According to sales analytics platform InsightSquared, increasing engagement can ward off churn risk. You have to keep your customers using your product so they keep paying for it. Higher engagement and lower churn mean more revenue for your company and more opportunity for growth. Increased utility and visibility helps users stay engaged. You need to keep engagement high to keep users from cancelling their subscriptions. A decrease in customer engagement is called activity churn, and it indicates that customers are finding less and less value in your product. Activity churn is a leading indicator of cancellation. 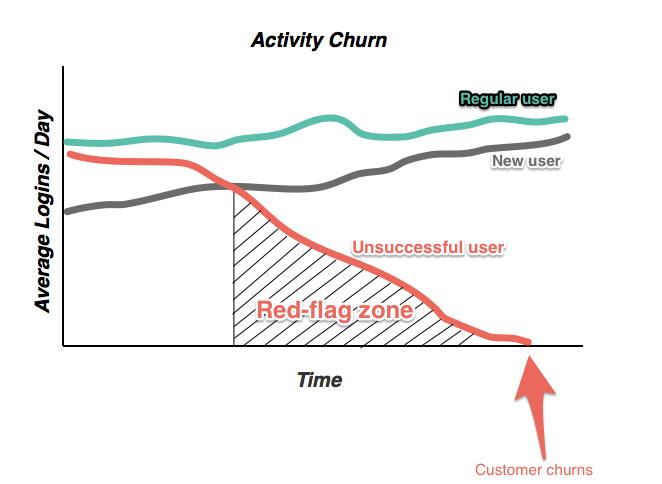 Decisions to churn are not usually made in an instant—they're made weeks or months before a customer actually cancels in the red-flag zone shown above, as the customer slowly stops using your product. Activity churn happens when customers don't find that your product is sticky and don't have a reason to engage. Since user churn undermines growth and drains your MRR, reducing your churn is a direct way to increase your MRR. You can be proactive about reducing user churn by focusing on increasing your product's utility and visibility. Adding integrations helps users leverage more value, which in turn increases engagement and reduces activity churn, which means lower user churn. All of this adds up to more cash in the bank for your company. Integrations with third-party products help reduce activity churn because they give customers more ways to engage with your product. They help your product to constantly show its value in many different ways. Integrations increase the utility and necessity of your product by adding to the value you've already created for your customers. This contributes to an overall better user experience that is more likely to keep customers coming back. Integrations help you embed your product in a SaaS ecosystem, which ultimately strengthens customer retention and benefits your company by increasing productivity, increasing depth and breadth of usage, and improving distribution and visibility. Your product aims to improve a specific aspect of your customer's life or a specific part of their workflow, but ultimately it's part of a larger picture. When you integrate with other apps, you show how your product fits into the big picture of accomplishing tasks and solving problems. Increased productivity contributes to a stickier user experience that discourages customer churn. For example, Zapier found that Typeform users who integrated with Zapier to push Typeform data to their other services showed about 40% less churn than users who used Typeform on its own. 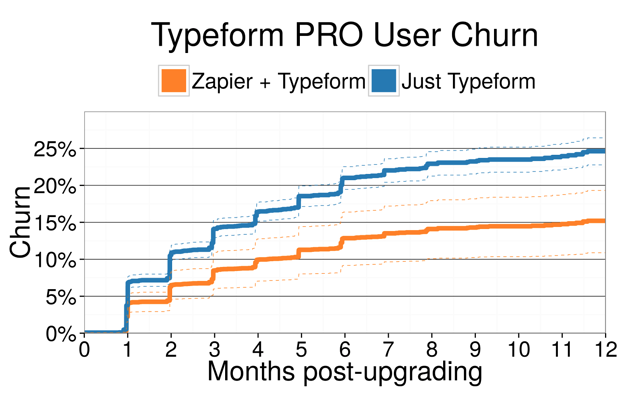 About 15% of the cohort of Typeform users who integrated with Zapier had churned at some point in 12 months. Meanwhile around 25% of the cohort of users who just used Typeform churned within the same time frame. The ability to use Zapier to push Typeform data to other apps adds to the productivity of teams who want to use their Typeform data. While this added productivity is not necessarily a direct cause of lower churn, it is a contributing factor to a better user experience because it encourages users to do more with the data that Typeform provides. Embedding within your user's workflow and making the entire workflow more productive can give you an edge up in the competitive SaaS landscape. For example, one Intercom user reports that though he has subscriptions to Intercom, Mixpanel, and UserVoice, he uses Intercom the most because it's the only one with a Slack integration. This makes it easier for his team to communicate about user tickets from Intercom in Slack. This helps to constantly put the value of Intercom in front of the user. 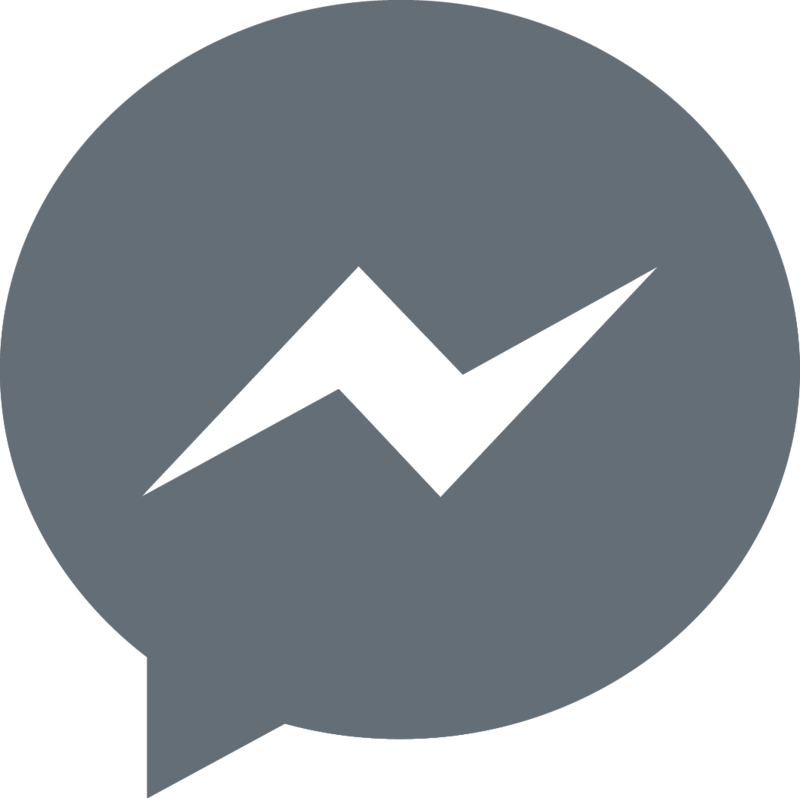 The team can merge customer support tickets and the surrounding conversation in one place, increasing productivity in answering the tickets. Intercom has become embedded in a channel that already had high engagement from this team—and as a result, this user calls Intercom “stickier” than the other products without Slack integrations. But whether or not Intercom is stickier than the other products, the only thing that matters is that the experience of using Intercom is stickier than the experience of using other apps—thanks to its integrations. Integrations also expose the depth and breadth of your products that may not be immediately apparent. This gives added incentive for a user to open your product, and use it for a longer period of time. Integrations that add depth and breadth, add something that your users value to make their lives easier. The integration should fit your target market, so that it adds the depth that your users need. It should be a natural extension, so that it adds the breadth that your users would seek. For instance, Kevy's integration with Magento specifically supports eCommerce companies who want to expand and grow online businesses. Magento provides a platform for eCommerce businesses, and Kevy helps an eCommerce company engage with customers and personalize online marketing. The two work together seamlessly because they both are built for eCommerce customers. Kevy's options for personalizing and customizing the user experience are a natural extension for eCommerce customers building a platform with Magento. 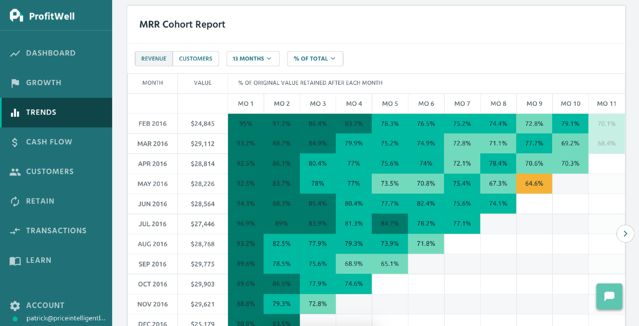 For example, Stripe, Braintree, and Zuora integrate with ProfitWell to turn the data that these platforms collect collect on subscription payments into graphs and charts for free, like this cohort analysis below. These graphs help Stripe, Braintree, and Zuora users leverage the data provided in more meaningful ways. For example, a company using Stripe can see changes in data from multiple paying users graphed over time. This could help a company find trends in a certain company's payments over time, or even uncover a payment trend within cohorts of customers. These trends that would be very difficult to visualize from dispersed raw data become clear when using a tool like ProfitWell. Stripe users can reach new conclusions and better see the value of their Stripe data. 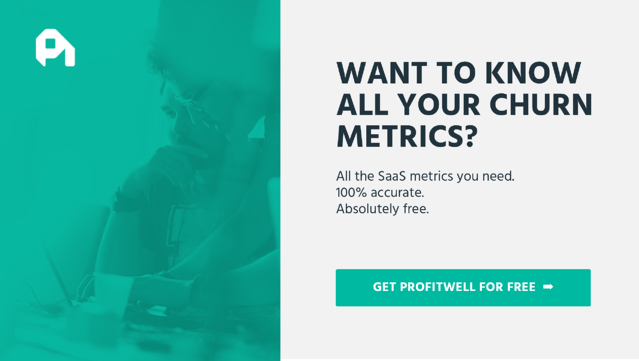 At the same time, users can better see the value of ProfitWell's data tracking systems when they use it to analyze their stripe data. The integration mutually highlights the depth and breadth of both products' value. Integrations with a more well-known products can help your product “ride the wave” of a larger platform. These integrations with popular products put your product in front of a hugely expanded market of potential users. Brian Balfour of CoElevate and Reforge points out that “products are built to fit specific channels,” and that should inform your product integrations. Your product can take advantage of the distribution channel of a larger product (Product X) by adding value for Product X's large base of existing customers. This increases your own product's visibility and distribution potential. Growbot, for instance, was built to capitalize on Slack's huge user base of over 4 million users. Growbot is a tool that allows team members to support one another with affirmations (called “cheers”) for a job well done, and tallies points that each team member receives for each cheers. 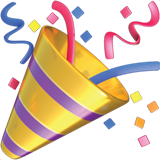 Cheers are communicated and tallied on Slack and take advantage of specific Slack features, like the ability to @ mention a teammate, and the ability to add emoji reactions to messages. Yet Growbot is its own tool with a separate value proposition from Slack. It adds additional value to Slack users, but was created to leverage the visibility and distribution of a high-volume, high-engagement partner product. For instance, Jet Blue's app recently integrated with Lyft to help travelers get to and from the airport and support their larger-picture travel plans. 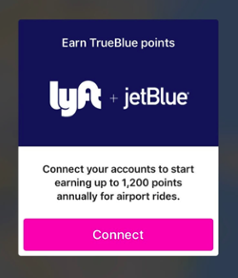 When travelers flying with JetBlue call a ride with Lyft from within the JetBlue app, they earn JetBlue loyalty points (which they can then use to gain other JetBlue benefits). This integration is great for Lyft, because JetBlue helps incentivize users to engage with Lyft's service. It's also beneficial for JetBlue, because the Lyft integration provides additional reason for users to engage with their app. It adds value to the app product and makes it stickier and more necessary for a traveler. Since Lyft is already a well-known ride sharing app, the utility of JetBlue's app (which is secondary to its airline services) benefits from the clout that Lyft confers. The overall integration helps to highlight the value of both apps to users who want to make travel plans. Integrations support and enhance your customer's big-picture process. They are valuable because they embed your product in a SaaS ecosystem. Integrating your product with other SaaS products communicates to your customers that your company is looking to improve their entire user experience. Better user experience supports increased engagement, which is the high-level antidote to churn. Add concrete value to your product by adding integrations—you'll combat churn and support your company's growth.